Carlos Sandoval is an Emmy nominated filmmaker whose work includes the award winning documentaries: THE STATE OF ARIZONA, A CLASS APART and FARMINGVILLE. A writer and sometimes lawyer, Sandoval’s essays have appeared in several publications, including The New York Times. He is a Sundance and MacArthur grantee, an advisor with Columbia Journalism School, and on the advisory boards of the IDA’S Enterprise Documentary Fund and Firelight Media. 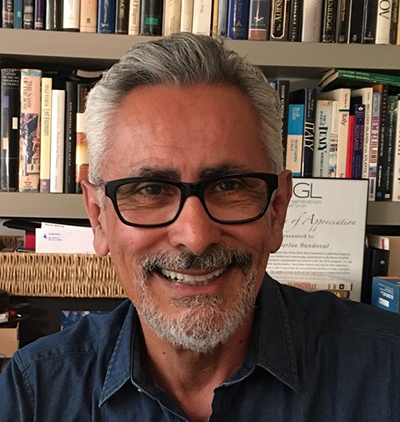 Sandoval has done extensive work in public media, including serving on several funding and programming panels and as Co-Executive Director of Next Generation Leadership. A founding member of Indie Caucus, Sandoval is currently at work on a documentary about Latinos and the criminal justice system. Sandoval is a native of Southern California and a graduate of Harvard College and of the University of Chicago Law School. Prior to his filmmaking career, Sandoval practiced law and worked in policy as a member of the US Delegation to the United Nations and as a program officer with The Century Foundation.